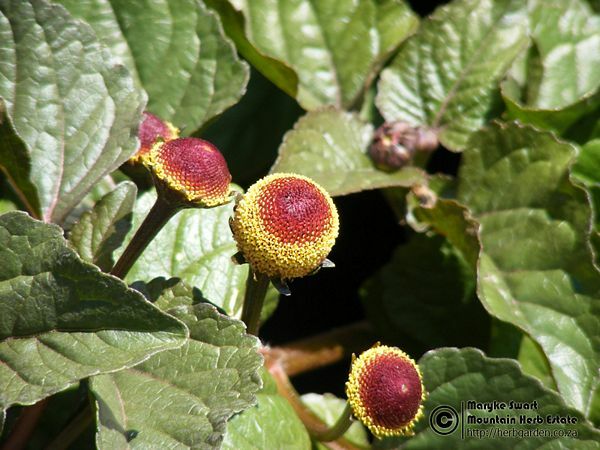 Toothache plant is native to South America and believed to be of ancient Peruvian origin. Today it is well known as a food plant in Southeast Asia and China. It is a tropical perennial that can be grown as an annual in temperate regions. Toothache plant is sprawling and much-branched, with olive-green to purple-flushed, ovate leaves and bears minute flowers that are borne on cone-shaped, yellowish-maroon heads. It can grow up to 40cm. tall, needs well-drained soil and full sun. The fresh, young leaves can be cooked like spinach and are used as salad greens - small amounts of chopped fresh leaves will add a unique flavor to salads. It can also be added to soups and stews and both fresh and cooked leaves are combined with chili and garlic to add flavor to dishes such as stews. The leaves can be cooked in coconut milk. The leaves and flower buds. The fresh leaves are rich in minerals and a useful source of folic acid and vitamin C.
The flower heads contain spilanthol and has antibacterial and antifungal properties making it a good purifying herb to use for disinfecting wounds, treating painful canker sores and treating ringworm infections. They can be chewed to make the inside of your mouth numb if you don't swallow it for a while. This will reduces the pain associated with throat and gum infections and will induce saliva secretion which will have a cooling sensation in the throat. The flowers are crushed and applied at the site of toothache. In India, they are used as flavoring in chewing tobacco.